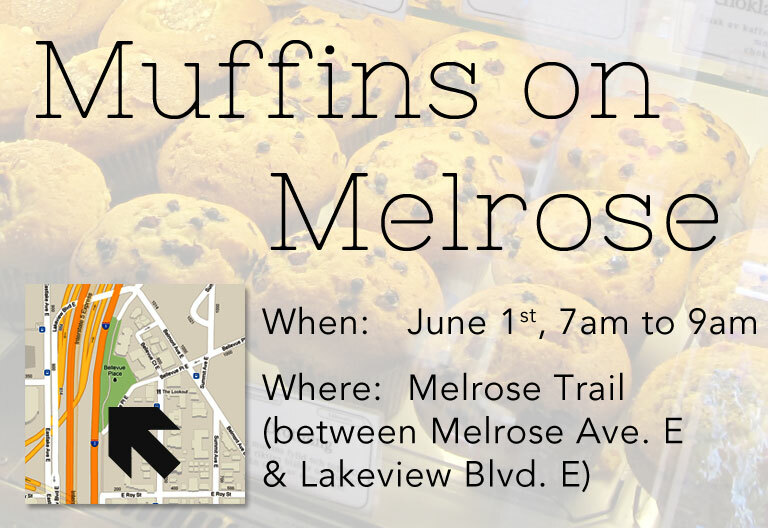 Our first Muffins on Melrose is this Friday! We are pleased to announce that Central Seattle Greenways has been selected by the City of Seattle to receive a $20,000 Neighborhood Matching Fund grant to support better pedestrian and bike infrastructure on the Hill! This grant will fund improvements and outreach to make the Melrose corridor a more attractive place for people to walk, bike, and even enjoy the view. Known as the Melrose Promenade Project, the grant will support volunteer community cleanups along Melrose and the trail at its northern end; a series of monthly “Muffins on Melrose” events to engage pedestrians and bicyclists about the future of Melrose and the efforts of Central Seattle Greenways over coffee and pastries; and, a community planning and visioning effort focused on the northern end of Melrose, the trail connecting to Lakeview Blvd, and the adjacent park and open spaces.